I am on writing on the heels of an Ottawa Citizen column that my buddy, Peter Loewen (@peejloewen), wrote regarding Eve Adam’s defection to the Liberals. The thrust of Peter’s argument was that we should dispense with the moral outrage at Adam’s crossing the floor: it’s hypocritical of us to admire ambition and tenacity outside of politics and then condemn it in our politicians, many of whom (notably Trudeau – aka, “the Spaniel” as I affectionately call him) were as opportunistic as Adams. I’d like to add another reason we ought not to be outraged by Adam’s floor-crossing: it’s actually fairly common event. I used data from the House of Commons (here) to construct a graph (below) that shows changes in the party affiliation of members of the House from 1962-2015. (Click on it to get a decent size view.) Note two things: 1) I’ve expressed these changes as a percentage of the House’s membership at the time to account for the fact that House has grown from 264-308 members over this time frame; 2) I based these percentages on the number of members who changed affiliation not the number of changes of affiliation. For example, David Kilgour left the Conservatives in 1990, sat as an independent for a couple of months, and then joined the Liberals in 1991. I count that as 1 MP changing affiliation, not as 2 changes of affiliation. There’s no right or wrong about this, but my method is the more conservative one — and even then the take home point of the graph is that changing party affiliation is a pretty common affair in the House of Commons. I went through each change of affiliation and classified each one as due to a i) party split, ii) a defection (i.e., the MP quits the party), or iii) an expulsion. Changes in party affiliation that come from party splits (e.g., Bouchard et. al leaving the Tories in 1990 to set up the Bloc) creates spikes in the data that catch the eye, but changes in affiliation due to defection are more common. 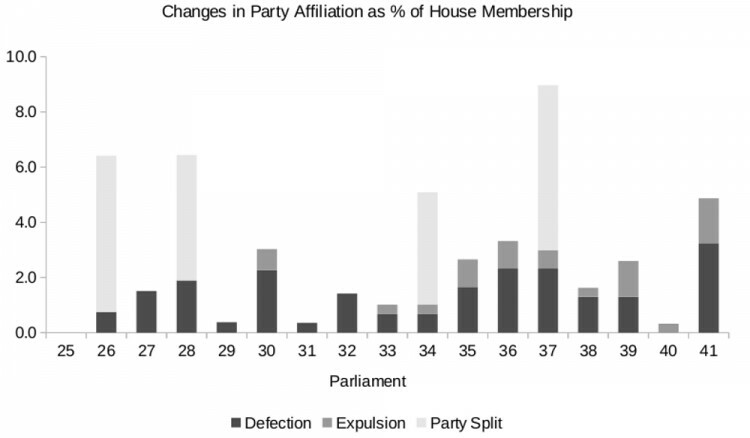 About 1.5% of MPs per Parliament change affiliation, so about 1 a year… every year, for the last 50+ years. So there’s another reason that we ought not to be shocked by Eve Adam’s defection: it’s mundane. OK, so the data don’t support moral outrage and shock, but they are perfectly capable of supporting sullen resignation and disappointment. And if that’s how you feel about all this floor-crossing, then let me say that I do think there are reasons to feel worse about it now than, say 40 years ago. The problem with Eve Adam’s defection is that she neither represents nor is representative of any identifiable community, interest, or ideological perspective. She is, in effect, a fungible indenti-kit politician of the sort that proliferates in an age of professional politics. This, I’d argue, is quite different than it was 40 years ago. Many of the folks who came to the House both represented and were representatives of an identifiable community or interest. There was no doubt, for example, that “Cactus” Jack Horner (who defected from the Tories to the Grits in 1979) represented Western farmers, Similarly, when Donald Johnston quit Turner and the Liberals over Charlottetown and Free Trade, he was representing a traditional strand of Canadian liberalism. But to an extent, Peter was right in his column when he suggested that our politicians’ failings are ultimately our own: what we would expect an increasingly monolithic society* to produce but fungible indenti-kit politicians who can inhabit one party as easily as another? * Don’t let the hyper-partisanship fool you, political ideology is pretty monolithic these days. If the left-right divide has grown wider since the 1960s and 1970s, its also come to define an axis of identity not of competition as Bartolini and Mair (1990) put it.